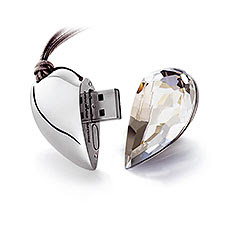 Slurps… Read about this nice bling bling usb drive on the mag recently. It’s an in-thing here now. Cool huh. It’s a necklace with Swaroski crystals. Will definitely make up a good gift this season but erm.. just too ex… EUR148 for a 1GB drive. Mmm… nice to see, nice to hold, but not when you see the price it witholds. Ceh…. Parents in law were in town for the Christmas. We don’t really celebrate Christmas, well… erm, we did la… celebrate the holidays. This year, again no exception. On Christmas day we decided to stay away from the Orchard crowd and went to Sentosa Island instead. Visited UnderwaterWorld and Dolphin Show. To sum up the visit in one word is not easy but 2 words yes… “EXPENSIVE” & “BORING”. @ UnderwaterWorld. There were a few big fishes, stingrays, baby sharks, crabs and that’s pretty much about it. $20 entry fee per pax is really quite pricey. One could finish touring the acquariums in less than 20mins. I noticed a cut at the side of Ryan’s left eye as soon as I came out from shower. I questioned Loida and she gave me a surprise look and said she had not noticed it earlier until I mentioned. I was really really angry. 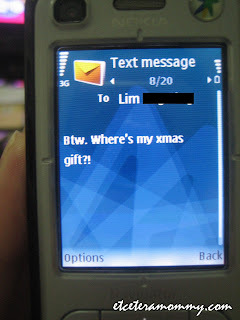 I sounded Loida for making calls to her friends not long ago (gave her permission to call “HOME” so she can greet her parents merry christmas but in addition to her parents, she ended up calling her friend at Lucky Plaza, her agent etc too. Total 4 calls!!!) and now she disappointed me for being so ignorant. Of course many assumptions ran through my mind, she could be the culprit, she could be not. Anyways, without proof it’s too early to jump into conclusion. I think I need surveillance at home!!! We didn’t really celebrate Christmas this year, not that we did in previous years though. Nonetheless, we did buy pressies for our lil one, nephew and niece inconjunction with the Xmas party held at cuz’ place. Oopss… x, 1x, 20 months now! We just came back from a short vacation? Where to? 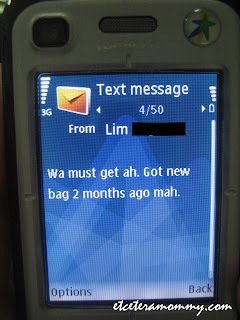 KL lor.. Muahahahahaha… It’s year end and hubs’ been asked to clear his block leave. Well, of all places why KL for vacation? Well, we were actually contemplating if we should go for some exotic holiday or go just shoot back to home sweet home in KL. It didn’t take me too long to decide on the latter. I really miss home. So KL off we went where we stayed for some good 6 days. The last week or so……..
Ryan turned 20 months. This time round, I’m stucked with his milestones. I do not know where to start or rather how to start. He’s growing taller, naughtier, cheekier, as the day goes by. And his current favourite phrase is “Oh Oo“. He’ll go “Oh Oo..mei yo mum mum” “Oh Oo.. No… ” literally “Oh Oo…“ for his mischief, for excitement, for surprises, everything infact. Two days back we discovered he had a white dot on the side of his mouth. That probably explains his recent crankiness. It has been days since he had a proper brush on his teeth. He whined as soon as he saw me with his toothbrush. Well, considering he’s having an ulcer I’ll spare him for now. Let’s see how it goes in a few days’ time. That’s all for now. Merry Christmas to everyone……………. I had my worst gastric attack last night. We were at Mid Valley for dinner when the pain really got up my head. I can barely walk, I can’t talk, I can’t eat (not even my fav salted egg prawns), I can’t do anything without curling myself up for the pain was just too much to bear. So when hubs asked if I still wanna go check out the Gardens, unwillimgly I said NO. Sobss… Imagine, I even went shopping when I was suffering from labour contractions (every 20 mins then). The only other time I said no to shopping was probably during my 1st trimester when I was suffering from severe morning sickness. So one could imagine how chronic the pain was………….sigh.